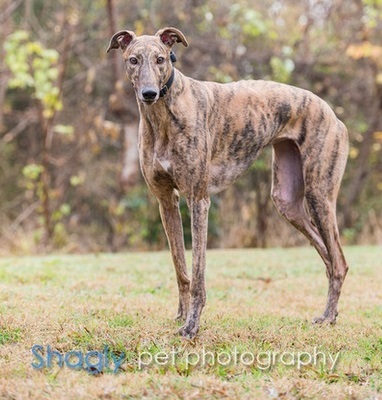 Kora, aka Killer Kora, is a 2½-year-old brindle female born February 20, 2012. Her sire is Lonesome Cry and her dam is Killer Stephie. Kora has 53 races on record, all at Gulf Greyhound Park. She started on September 5, 2013 and finished on August 1, 2014 with a broken right hind leg. Kora has not yet been tested with cats or other small animals. Kora had surgery on August 6, 2014 performed by Dr. Stephen Kerpsack of Central Texas Veterinary Specialty Hospital to repair her fractured right central tarsal bone which was complicated with an intertarsal joint collapse. A 7-hole plate was inserted for stabilization along with screws. Kora will be in a cast for 6-8 weeks with weekly bandage changes while her leg heals. She is being kept very quiet in her foster home. Kora has been medically dismissed by Dr. Kerpsack as she is using her leg more and more each day. 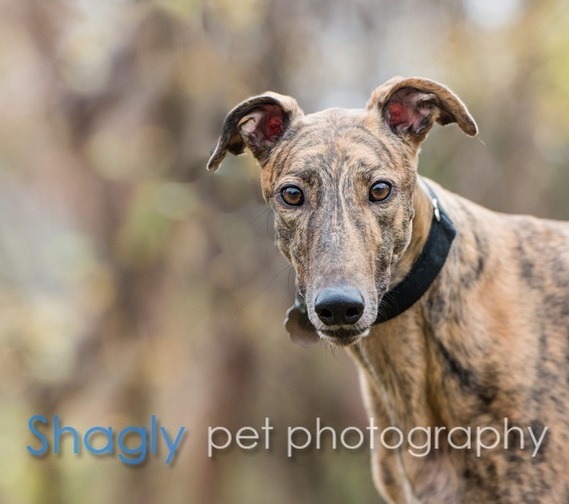 She has completed her medical procedures and is ready to find her forever home! 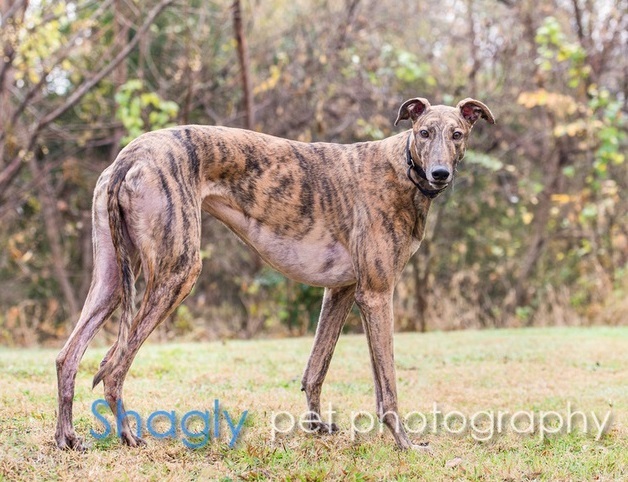 Kora is quite a katch with her gorgeous brindle markings! She is somewhat reserved at first and once she knows you, is very loving. All she requires is a comfortable bed and a person or dog buddy nearby. Kora hasn't expressed much of an interest in toys, though she will occasionally carry one from room to room but doesn't play with them. Kora is still working to put weight on her previously broken leg and has no problems navigating tile or hardwood floors. She does really well on a leash; we take slow walks and when she gets tired of hopping, she will walk on all 4 legs with no problem. If she encounters a dog or person she does not know when we're out, she does get a bit nervous and tries to move away. With coaxing and soothing, she calms down. Kora has perfect house manners, doesn't counter surf, doesn't get on furniture, rides beautifully in the car, sleeps on a dog bed in our bedroom and LOVES food! If you're not careful, fingers are fair game for a nibble when a cookie is involved. Kora is a sweet young girl and will make a wonderful companion in her forever home.